CherrySue, Doin' the Do: Living the Dream on Lough Derg! The cottages really are picture perfect. They all have three bedrooms that sleep up to 6 people however we brought our own travel cot and there was plenty of space for it. There’s a TV in the living room & free WiFi throughout. 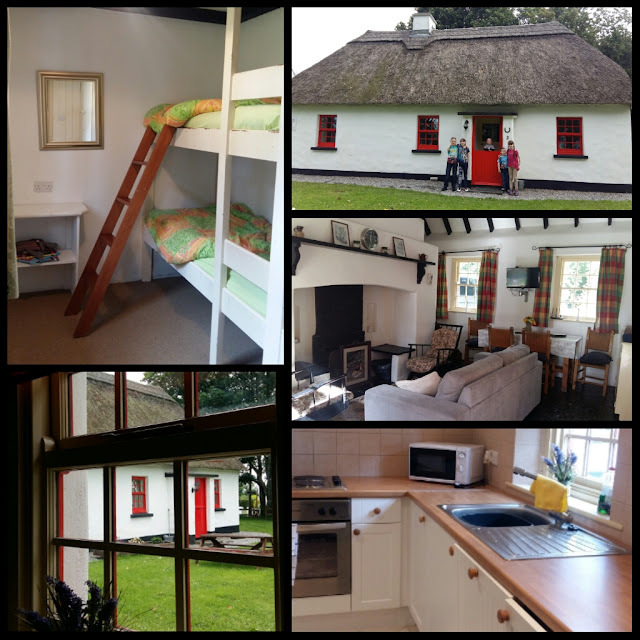 The cottage comes complete with a modern kitchen which included everything you could need to cook for the duration of your stay. I found it great to make breakfast & pack a picnic for our days out. One of our favourite features was the open fire with a few sods of turf. We just had to light it & the smell was amazing it transported me back to my childhood family holidays down in Connemara & Achill Island. If you wish to book call them directly and cut out the middle man! More info can be found HERE. 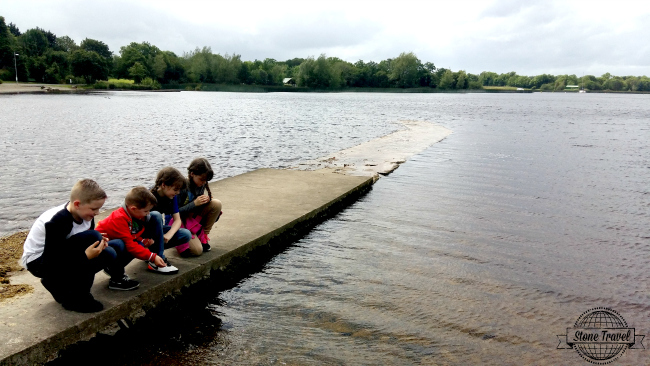 Aquasplash Lough Derg is just 5 minutes away & you’ll receive a 20% discount while staying in the cottages. We didn’t go on our visit as I had a full itinerary to make up for the things I promised we’d do on our last trip to Lough Derg. We took a 10 minute drive out the road to Nenagh to visit Nenagh Heritage Centre. 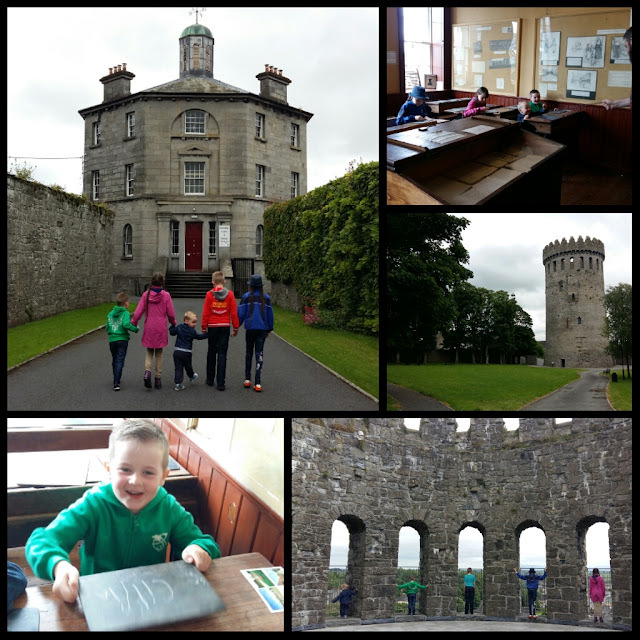 We spent just over an hour exploring the school room, the shop, the kitchen, the dairy, the museum of natural life and a private guided tour of the gaol. We enjoyed every moment and I even bought some paintings from the gallery! Entrance is free of charge as is Nenagh Castle across the road. The castle dates back to the 1200’s, it is 100 foot high and the views of Nenagh from the roof are amazing. We took a drive of about an hour and a half to get to Doolin, it’s a gorgeous part of Ireland if you haven’t visited yet you really should. Doolin2aran ferries kindly gave us a complimentary family pass to visit Inis Oirr. However when we arrived it was a bit wild out to sea so they recommended we wait till a later crossing so it’d be a bit calmer for the kids. We took their advice & headed to the Cliffs of Moher just up the road. The cliffs are beautiful, we’d only visited with the kids a couple of months ago but it was foggy so this time we got to enjoy the views. Entry is €6 per adult while children are admitted free of charge. We arrived back to Doolin to get the 1pm ferry across to Inis Oirr. Journey time is just 30 minutes; Orla & Aoife were thrilled to see some puffins flying close to the water as they absolutely love birds. It was still a little rough out to sea but the children really wanted to sit outside and I knew it helped with potential sea sickness to keep an eye on the horizon so we sat on a bench along the side of the boat. One of the lads came rushing around to help when he heard a squeal but laughed when he saw it was squeals of delight from the kids at the water splashing over the side rail. 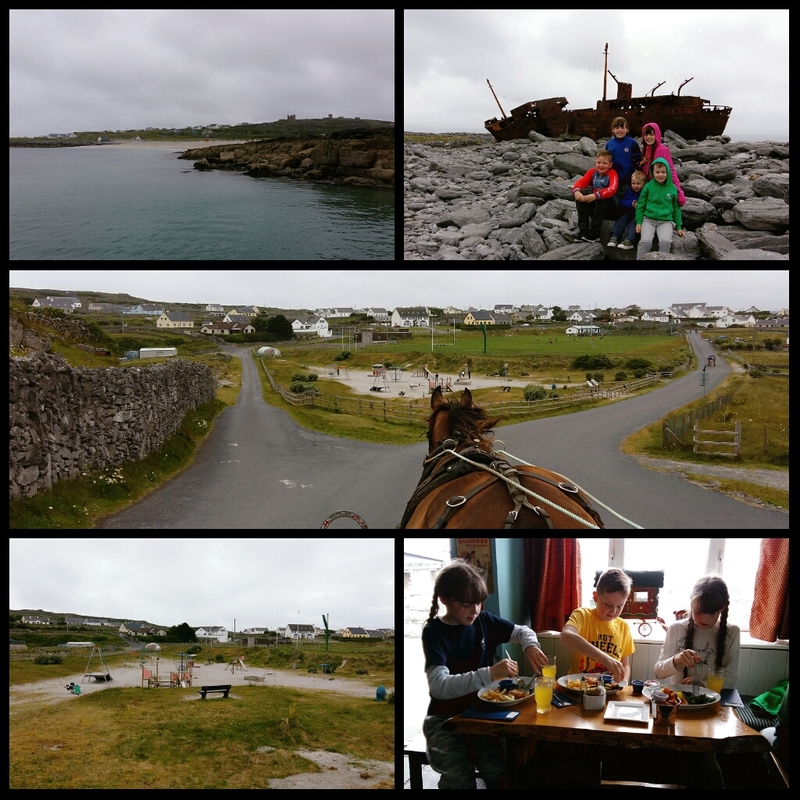 When we arrived on the island we decided to take a guided tour on a pony & trap costing us just €20 for our family of 7. There’s also a bike hire place right at the pier if you wanted to cycle the 3km x 2km Island. Our hour long tour took us past the gorgeous beach and playground that’s listed in most of Ireland’s top 10 playgrounds on by the airport & graveyard around the coast to the famous Plassey shipwreck and back to the pier all while being regaled with stories about the Island and its people. We popped into Tigh Ned pub for lunch of fish & chips washed down with cool drinks costing just €46 for 7 of us. 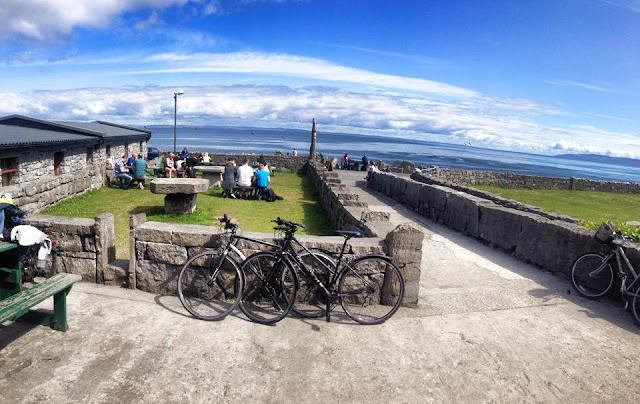 The beer garden out front with views of the Clare coastline & Galway Bay is the perfect spot to while away an hour or two but we didn’t have the time as we had to go let the kids have a play in the playground before our ferry back to Doolin. We were supposed to do the Cliffs of Moher cruise on the way back where they take you right up close to the cliffs where you can see the puffins nesting but unfortunately the weather was closing in again and we couldn’t do it. It didn’t matter though as we had a superb time and the kids laughed their heads off most of the way back with the sea lapping up the side of the ferry and sometimes over onto their feet! 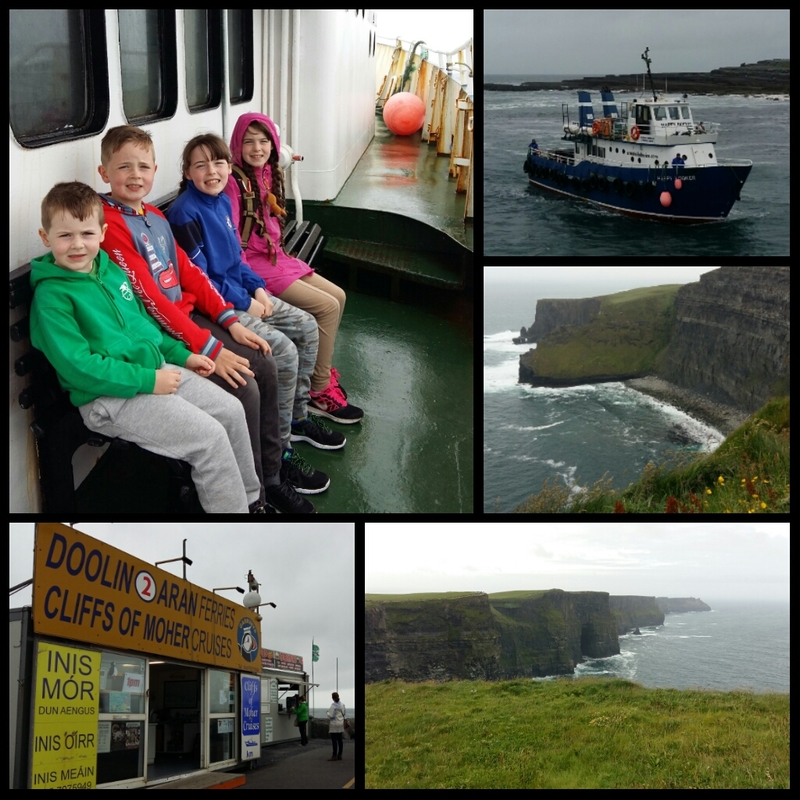 Daytrips to Inis Oirr with Doolin2Aran are priced at €20 per adult & €8 per child, under 5’s travel free of charge but need a ticket. Family tickets are available at a discounted price more info HERE. 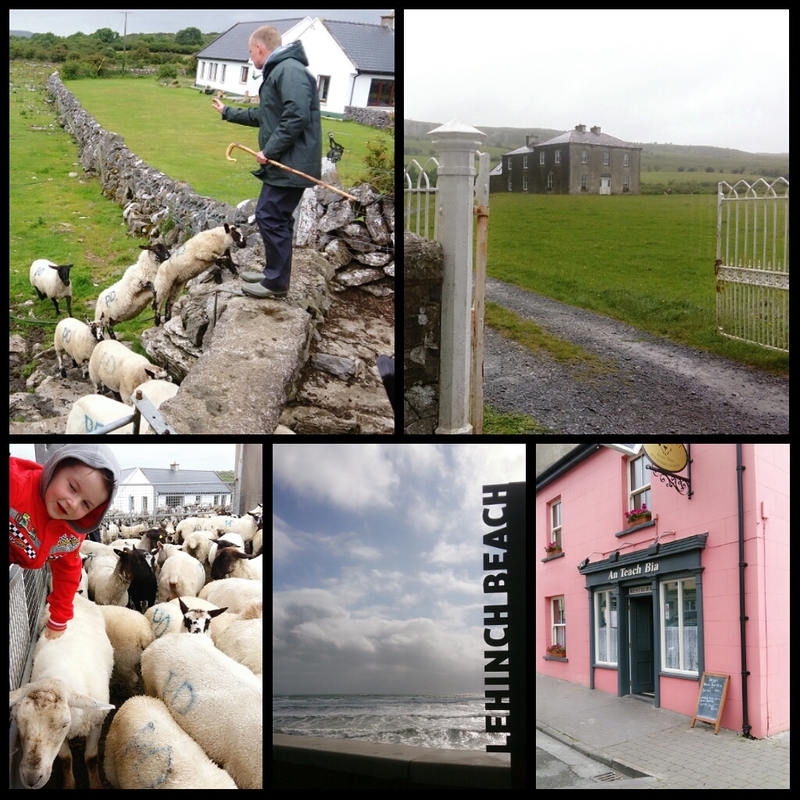 Another day trip we took was to Caherconnell ring fort and sheep dog demonstration in Carron an hour and a half away. We enjoyed learning about the dogs & Seamus even got to have a go at herding the sheep! It started to lash so we didn’t get to explore the ring fort on this trip. Seeing as we were in the area we swung by Fr.Ted’s house for a photo unfortunately they were booked out for afternoon tea when I had tried to book a few weeks previously. Then it was on to Lahinch for walk along the seafront before a wonderful dinner in An Teach Bia costing just €45 for our family of 7.